← Congratulations Week 02-17-14 Giveaway Winners! Karen’s Killer Fixin’s **AUTHOR SPECIAL** with VICKI ESSEX! Welcome to my Friday bonus feature called Karen’s Killer Fixin’s **Author Special**!! Today, in lieu of one of my own recipes, I’m going to introduce you to a new author who will share one of her favorite recipes. Not only will you and I occasionally learn how to make something new and delicious, but we’ll get a chance to check out some wonderful authors. Introducing author, VICKI ESSEX, and her favorite recipe for DOUBLE CHOCOLATEY-CHIP COOKIES! KYLE STOMPED ON the brake and jerked the wheel to the right as the maniac on the bike barreled toward him. The figure in black and red whipped by, his loaded backpack brushing Kyle’s newly detailed convertible. Something metal bounced against the side of the car like a dud missile, rolling under the chassis. He slammed the heel of his palm against the wheel. No one touched his baby. The bicycle skidded to a stop. The front wheel popped up and pivoted around as the rider deftly maneuvered it like a rearing show horse. A horn blared, and the driver of the car the cyclist had barely dodged rolled down the window, shouting obscenities. The cyclist studied the ground, frowning, eyes masked by reflective sunglasses. He looked up briefly and screamed an obscenity right back. She ignored him as she walk-rode her bike back between the stalled lines of traffic, searching under the cars she’d passed. The driver who’d screamed at her started to get out of his car, swearing and waving his fist. This was going to get ugly, and the cyclist had no idea the man was stalking toward her. “You’re riding on the wrong side of the road,” Kyle told her when she was within earshot. The driver from the other car continued yelling but was hesitant to stray too far from his vehicle. Kyle popped his seat belt, ready to intervene. The woman scrambled off her bike and leaned it against the driver’s-side door. “What are you doing?” He fought the urge to shove her bike off the side of his convertible. “I dropped my water bottle.” Her voice was smooth and sooty, tinted with an accent that definitely said not from around here. She got down on her hands and knees and reached under his car. Kyle got an eyeful of backpack, booty and muscular calves, and his ire was momentarily forgotten. “No, it’s not.” She said it matter-of-factly, without the slightest trace of defensiveness or irony. “I can see what’s coming, and so can you. I don’t see what you’re worried about—you’re the one behind two tons of steel.” She rapped on the side of the car. Her flippancy reminded Kyle of his sister, Jessica. He frowned deeply. He was not going to let her get to him—or have the last word. “Listen. I don’t know where you’re from, but in this city, you ride on a bike path and follow traffic laws. Otherwise, I can’t say what’ll happen. Not everyone is as nice as me.” He glared pointedly at the driver who’d gotten out of his car—the man looked like he still wanted to club her over the head. When Kyle narrowed his eyes at him, he stomped back into his vehicle. The woman noticed the exchange. She lifted her chin a fraction, acknowledgment and challenge clear in her strong, stubborn jaw. He couldn’t see her eyes behind the mirrored lenses but felt as if he were being studied by a predator. “Of course. You’re right. I apologize.” Her full lips tilted up. A jolt of surprise hit him. He’d expected her to put up more of a fight, maybe scream at him in a fit of bipedal road rage. The traffic ahead was moving again, and the cars behind Kyle honked. He quickly buckled up and inched his vehicle forward, giving the woman enough space to retrieve her battered aluminum water bottle. She swung a leg over the bike and started to go with traffic, staying right next to Kyle’s side-view mirror. When he finally regained his speed, she kept up with minimal effort, legs pumping. Flashes of her well-sculpted body danced in his peripheral vision. He stared. He didn’t know what this woman’s problem was, but he was done with her. He was going to be late for work and he had an important client coming. “I’m taking the next right,” he said, then cursed himself for warning her. “Me, too.” She gave him an enigmatic grin. Kyle gripped the steering wheel, suppressing the urge to yell at her to back the hell off. His heart thudded. Sweat dripped from his brow. The sweltering New Orleans heat was only slightly moderated by the thin cloud cover. He wished now that he’d put the top up and turned on the air conditioner. At least then he wouldn’t have to deal with his cycling stalker. He’d have to shower again before his new client arrived. A Fiore was not someone whose hand you wanted to shake when you smelled like balls. He tried to focus on driving, but the whole time he was ultra-aware of the pilot fish cyclist in her skintight cycling gear. She stayed so close that at stoplights, he could practically smell her—a strangely enticing combination of spice and something like fresh-baked bread. Like a hot-cross bun. His eyes darted left as she slowed. Staring at her hot-cross buns nearly made him miss his turn. He yanked the wheel right. She arced away from the car, caroming into the next lane. Suddenly free of her, he floored it, speeding ahead and leaving her far behind as traffic closed around her. His tense shoulders relaxed as he pulled into the parking lot next to Payette’s, the official Unlimited Fighting Federation’s mixed martial arts gym he’d been managing for the past three years. He grabbed his gym bag from the backseat and headed to the front door. His footsteps faltered as the cyclist coasted to a stop and alighted from the still-moving bike right beside him. She snatched it up as if it were broomstick. “You left me behind.” She took out a sturdy U-lock from her backpack and attached the bike to a stand in front of the building. Kyle didn’t say anything as he continued into the gym. “Hey, wait up!” The woman’s sooty voice dogged him. “I have somewhere to be,” he said without turning. He was used to dealing with hangers-on. Maybe she recognized him and wanted an autograph or something. If she tried to give him her number, he’d be sure to lose it as quickly as possible. About the author, Vicki Essex…. Vicki Essex lives on a space colony with her husband, space cat, robot dog butler, and a fleet of red spaceships…in her imagination. 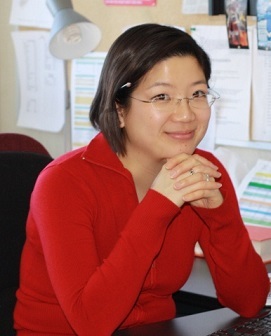 In reality, she lives in Toronto, and relies on long commutes to keep her writing. She loves to hear from readers. She also loves junk food. Send her some, won’t you? Visit her website at www.vickiessex.com, on Facebook.com/vickiessexauthor, and on Twitter @VickiEssex. I hope you enjoy the recipe Vicki is sharing with us today on Karen’s Killer Fixin’s. Happy eating! P.S. We’re at 132 recipes and counting with this posting. Hope you find some recipes you like. If this is your first visit, please check out past blogs for more Killer Fixin’s. In the right hand column menu, you can even look up past recipes by type. i.e. Desserts, Breads, Beef, Chicken, Soups, Author Specials, etc. A Note from Vicki: These are my crowd-pleasing cookies—soft, chocolately and great for making people smile. Cream butter. Add sugar, eggs, vanilla and cocoa powder. Sift in flour, baking soda and salt until well mixed. Incorporate chocolate chips. Chill dough for at least 1 hour. Scoop and roll out 1-inch balls and place on a cookie sheet lined with parchment paper or a silicon mat, spacing them about 2 inches apart. Place on middle racks for 6 minutes, then rotate the trays fully in oven and leave for another 6 minutes. Remove from rack and cool. Makes about 4 dozen cookies. 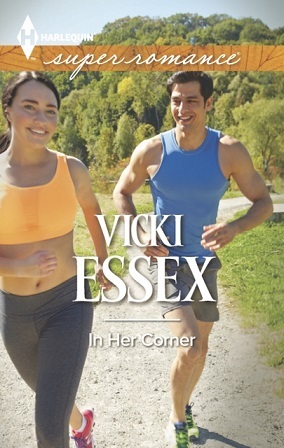 **SPECIAL ANNOUNCEMENT: Vicki will give away one copy of IN HER CORNER to one lucky reader who comments on her Karen’s Killer Fixin’s blog!! Don’t miss this chance to read this novel!! Thanks, Vicki, for sharing your release and your fabulous cookie recipe with us! Fun excerpt and DELICIOUS-looking recipe! Oh, man…I’m going to have to become a cyclist just so all those cookies I’m about to make don’t go straight to my hips. Thanks for sharing! Wishing I was kicked backed eating your cookies and reading your book this evening ! Oh boy, I know what I am going to be making this weekend!! I have read both “Back to the Good Fortune Diner” and “Her Son’s Hero” and loved them both! Can’t wait to read this new book. Thanks for this giveaway. Good luck everyone!